All great stories start somewhere, here's ours... It all started with a train ride in 1946. On his way home from the war, my grandfather E. Earl Hall struck up a conversation with Horace Head, renowned floral designer and FTD master design instructor. As the two talked, Horace was so impressed with my grandfather’s personality and character he offered to not only train him, but invited Grandpa (Earl) to become a partner in purchasing a floral studio in Palm Springs, CA. 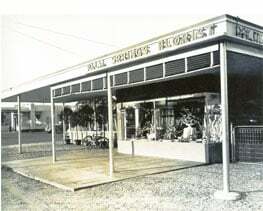 “Uncle” Horace and Grandpa opened the doors of Palm Springs Florist March 1947. In August of that year, Grandpa headed home to Salt Lake City to marry his sweetheart, my Grandma, Mary Lou. The two packed up what belongings they had, traveled by train to Los Angeles, then with Earl’s brother pulled their first home, an 18’ trailer, into Palm Springs and settled in on September 1, 1947. The trailer had no air conditioning, and the shared bathroom facilities were down the road. Grandma later said, “If we weren’t young and in love, I would have headed home out of the scorching desert heat!” With no knowledge of the business, and lots of trust and support from Mary Lou, Earl went to work. Their first deliveries were made by Grandpa on his Schwinn bicycle (visible in photo below) while Grandma rode on the handle bars holding the flowers. In the early years, Palm Springs Florist was on the outskirts of town surrounded by a developing oasis in the desert, known for its golf & tennis resorts & vacation homes to many famous movers and shakers from Hollywood and all over the world continued to blossom. As Palm Springs developed into a popular and iconic location, Palm Springs Florist became the “go to” place for all things floral. My grandfather built a reputation of outstanding customer service and the finest blooms in town. As friendships developed with many of the local celebrities, my grandfather frequently serviced the floral needs of Frank Sinatra, Bob Hope, Elvis, Lucile Ball, President Eisenhower, Liberace, and many more. Seventy years later, we are is now into our third generation. My Dad, Brent and I, are running the show. The Schwinn is long gone, replaced by a fleet of delivery vans. Endless stacks of paper have been replaced by a state-of-the-art computer system. Our team includes award-winning designers and a first-class delivery crew. Over the years we have enjoyed and celebrated numerous accolades from the community and our loyal customers. While things have changed, the foundation of hard work, uncompromising standards and amazing customer service that my grandfather left for us continues to be our cornerstone as we look forward to the next seventy years. It's always helpful to place your orders in advance of major holidays to ensure a timely delivery. Our shop serves the following areas: Palm Springs, Rancho Mirage, Cathedral City, Palm Desert, Bermuda Dunes and Indian Wells. Please contact us directly at (800)214-7441 or 760-325-7441. We're always here to serve you and make your flower-sending experience a pleasure.